Starting a young horse is an exciting prospect. You’ll notice we’re not ‘breaking’ him, because that term describes the very opposite of our goal. The process should be enjoyable for the horse, so he is willing to do whatever his rider asks of him. 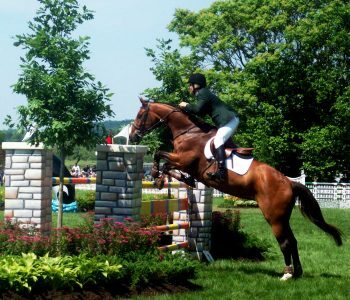 First, “your horse must see you as his ‘comfort zone,’” writes Richard Maxwell in From Birth to Backing. This book was my bible when I backed my own horse, and I cannot recommend it highly enough. 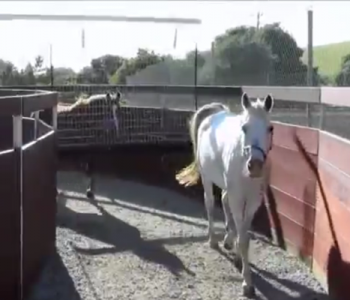 He warns against ‘instilling fear and resistance’ into young horses. Join-up is a technique popularized by Monty Roberts and advocated by Maxwell, a student of his. The horse learns to see you as a trustworthy leader whom he wants to follow. 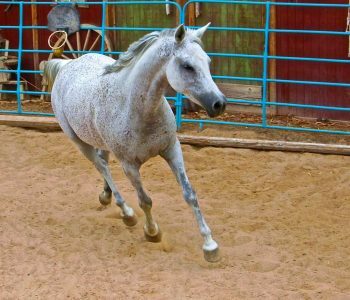 Join-up lays the ideal foundation for a young horse’s training and is best performed in a round pen. A good join-up is important before putting any equipment on your horse, so that he “knows where to go for reassurance,” according to Maxwell. Well before it’s time to back him, accustom him to wearing a surcingle, followed by the saddle, in his stall. Add a bridle with no noseband and a brow band which doesn’t pinch his ears. The horse’s back and teeth should be checked before putting on the saddle and bridle: “you do not want him to associate them with pain,” says Maxwell. 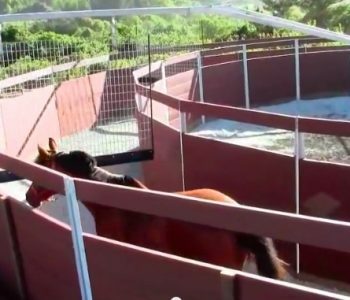 Once the horse is relaxed with the equipment in his stall, let him loose in the round pen. First put on the surcingle so he can get used to the feel of moving with it on, then graduate to the saddle and bridle, without the reins. Be confident in all your movements. If you think’s this is all normal, so will he. Maxwell prefers long reining, as he feels lunging will confuse the horse after join-up. This is a matter of preference. I wasn’t experienced with long-reins so I lunged my horse, and he was fine with it. On the lunge the trot is the pace where “most horses find it easier to acquire certain looseness and start to let the neck drop,” according to Spenlen. Lunge sessions should not take longer than twenty minutes, with frequent changes of direction. When the horse has learned to walk, trot and canter calmly on the lunge, Spenlen adds side reins. These should not exert pressure on the horse’s mouth, side bar or poll. They can be shortened very gradually, but only to teach the horse to “stretch towards the bit and not to shorten the neck.” They should be the same length, with the horse’s nose on or just in front of the vertical – never behind the vertical. However, Spenlen stresses that rhythm is much more important than contact at this stage. Rhythm results from the horse being balanced, while moving naturally and loosely, and is the first phase of the Training Scale. Approach backing with confidence and your horse will not think he has reason to worry. As Maxwell says, he is in part already backed “if he is happily carrying all the equipment he needs in order to be ridden” and listening obediently to commands from the ground. Begin by working him as usual in an enclosed area to give him “the opportunity to move freely and achieve a certain relaxation,” Spenlen says. 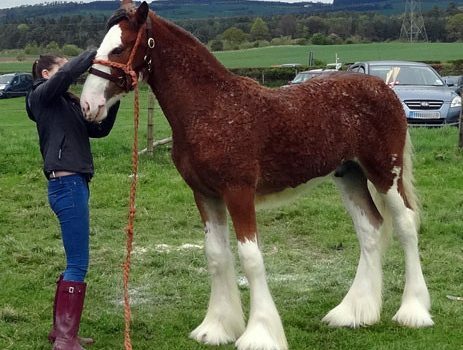 You’ll need a helper to hold the horse while you mount for the first time who keeps things relaxed, and doesn’t grip the horse tightly or he’ll panic. Attach the lunge line to the bit. A lead rein coupling attached to both bit rings will prevent the bit from sliding through the horse’s mouth if your helper needs to exert any pressure on it. 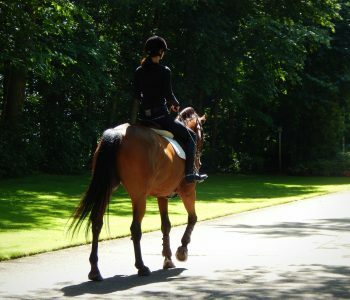 A neck strap is also a good idea, for the rider to grab if necessary without upsetting the horse. A leg-up is the best way to get on the horse’s back. Don’t immediately sit up in the saddle, but lie across it on your stomach. Talk to your horse all the while, and stroke his neck on the other side. It will be the first time he’s seen you on both sides of him at once! Practice legging up and leaning over your horse several times, from both sides, while your handler holds him lightly. Keep your upper body low at first, with weight not fully in the saddle, and quickly place your feet in the stirrups to help you balance evenly on the horse’s back. Gradually raise your body. Once he accepts you sitting up, remain there for a few minutes before dismounting. Spenlen says, “With nervous or very uptight horses it may be better to let them walk immediately to avoid building up more tension.” Then have your helper gradually bring him back to a halt for dismounting. Maxwell warns that the horse may be more concerned by your weight coming off his back than when it went on. Have your handler keep chatting to him reassuringly as you get out of the saddle. Repeat the process of mounting and dismounting several times. Initially, the handler controls the movements of the very unbalanced horse, so begin with a few steps and no contact on the reins. The rider should lean forward slightly and hold the neck strap so as not to get left behind if the horse suddenly stops or lurches forwards. 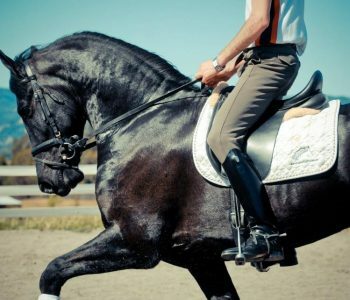 When the horse understands the handler’s requests to start and stop, the rider should then apply rein and leg aids in conjunction with those cues. The handler then becomes less involved until the rider is dictating the pace. When it’s safe, remove the lead rein. You are now riding your horse. Use minimal rein contact, and steer him with an open rein. To ask for halt, use your voice while pulling gently on the reins and your neck strap. Instead of carrying a whip, flick the end of the reins on his withers to ask him to move forward. Maxwell suggests carrying a soft rope to tickle him behind your leg as an irritant, rather than a punishment. 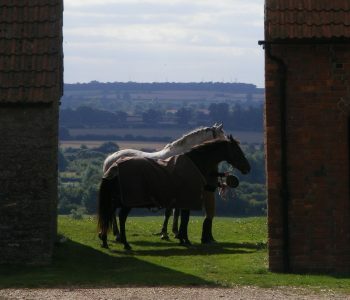 Ask for trot early on by employing voice and leg aids, with no rein contact. 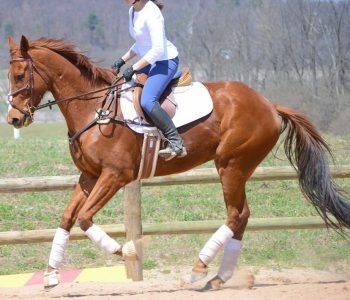 Request just a few strides at a time: your horse is still very unbalanced with you on him. He’ll find cantering easier but a small circle is hard work for him. So choose a wide open space for the first canter. He’ll tire quickly as he’s not fit enough to keep going at this stage. I followed Maxwell’s advice to take a newly-backed horse out alone on the trails early on in his training. Seven days after starting him, I took my gelding out on his own. Since then he has been perfectly happy to go out on the trails alone or in company. 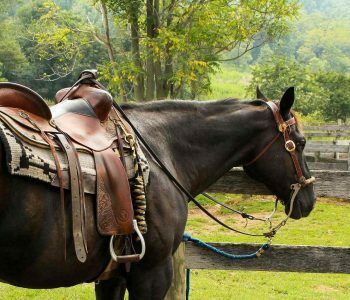 If your horse has learned to trust you before you back him, the actual process of teaching him to carry a rider will be a natural progression of his training. Approach backing with confidence. 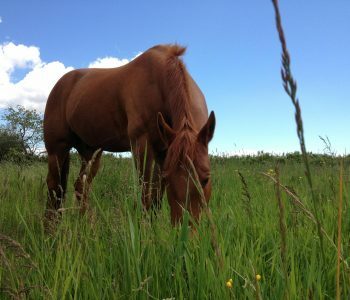 It will be a calm event and a stepping stone on the route to a rewarding partnership with your horse. Monty Roberts Join-up with Martin Clunes’s Horse Watch this video for a light-hearted look at join-up!